If you are currently using or considering using Google Adwords Express you must read this. What is Google Adwords Express? This is Google's answer to how to get more small businesses to start using Google Adwords and running pay per click ads for their business. Just like Google Adwords, your ads are eligible to show on Google.com, Google Maps and relevant websites on the display network. Over the years, the Google Adwords platform has continued to get more complex which can make it intimidating for small businesses. Ever since the death of the Yellow Pages, companies have come and go trying to fill the gap that was left behind by attempting to make it simple for a small business to manage their own marketing. The problem is on a local pay per click campaign a $500 monthly budget can go a long way, but a typical management fee on that budget should be anywhere from $750-1,500 with an agency or pay per click manager that knows what they are doing. Many small businesses have a hard time wrapping their head around the management fee being greater than the advertising dollars. Meanwhile, 10 years ago that same business would spend $5k-$20k/year on a Yellow Pages ad where you had zero control over the results. Dozens of software companies have tried to solve this problem with little to no success. "You’ll set up a budget, and based on the type of business you have, we’ll come up with a list of search phrases that will trigger your ad and potential related sites where your ad can appear. We’ll continue to maintain and update your search phrases over time. Minimal ongoing management is needed, and you pay only for clicks that your ad actually receives." Now you do have a little bit of control with the keywords. Google will suggest keywords and you have the choice to keep them so it's not 100% automated. So why exactly shouldn't you use Google Adwords Express? There are two major issues that completely ruin their intentions. 1. All keywords added are broad match. As most PPC Managers know, this is a bad idea. Less than 5% of the keywords we manage out of hundreds of thousands are broad match. This is likely to cause the majority of your traffic to come in on poor quality search queries that are irrelevant to your business. On top of that there is no control over the queries because you cannot see them or add negative keywords. 2. There is virtually no conversion tracking. So Google is "optimizing" to your goal, but if your goal has anything to do with website conversions instead of calls, they have no insight and neither do you. They recently added a method for linking a Google Analytics account and importing goals, but if you are using Adwords Express because of its simplicity you likely do not understand how to setup Google analytics so this addition is practically pointless. 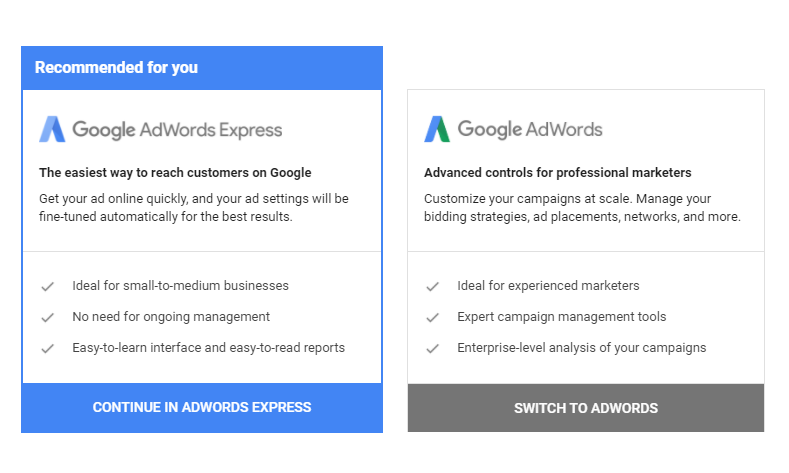 What happens when you use Adwords Express? Typically we see one of two responses. Either you have no clue how it is working and you just continue to run it and spend money, or you do not believe it is working so you turn it off and are left with a sour taste in your mouth about running Google Adwords for your business. When we know how well Adwords can work for many small businesses neither of these responses are good. What should you do if you are launching your own Adwords account yourself? Contact us and we will help you get started. We have great packages for small businesses. If you still want to manage it yourself, no problem. We will point you to a few resources that if you spend just a couple hours learning you will be able to avoid a bad experience with Google Adwords Express.